If I had to narrow down my skincare concerns then the two things that come to mind are dark circles and an unexpected spot that pops up when you least want it. Both are things that I can never really get rid of, spots will reappear and well, I don’t think dark circles will ever go, but I have discovered two products from Origins that offer a source of relief for me. 1. 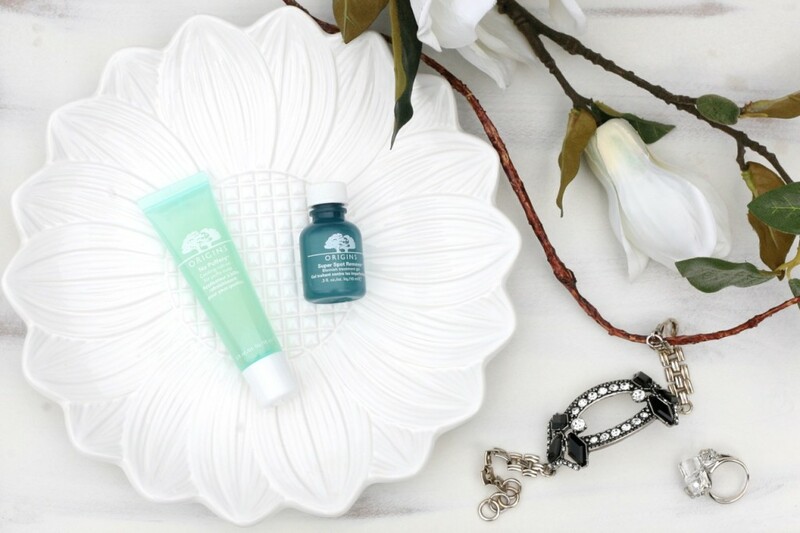 The Origins Super Spot Remover (on the right) helps fight, heal and fade spots and comes in a gel form. Like any spot treatment though, it works best if you use it at the point you feel a spot appearing and I have to say compared to everything else I have used, I think this does work and it’s something I’ve repurchased a few times. This spot treatment contains salicylic acid to heal the spot and caffeine and red algae to relieve redness. You do get a slight tingling sensation when you apply this and the skin can feel a bit tight but this is not too much. It’s good for specific spots and not all over the face and you will need to apply this a few times before you see results (yes I know, I wish there was something that zapped spots the minute you apply it, but it ain’t gonna happen!!). If you have sensitive skin or suffer from acne then this might actually be a bit too harsh, so please check out the ingredients first. If you are wondering about the packaging, it really is that small (I thought I accidentally bought the tester the first time) and at £15 for 10ml only it is a bit of a shocker but a little goes a long way and provided my skin behaves itself this can last for about 10 months for me, which is pretty good going. 2. 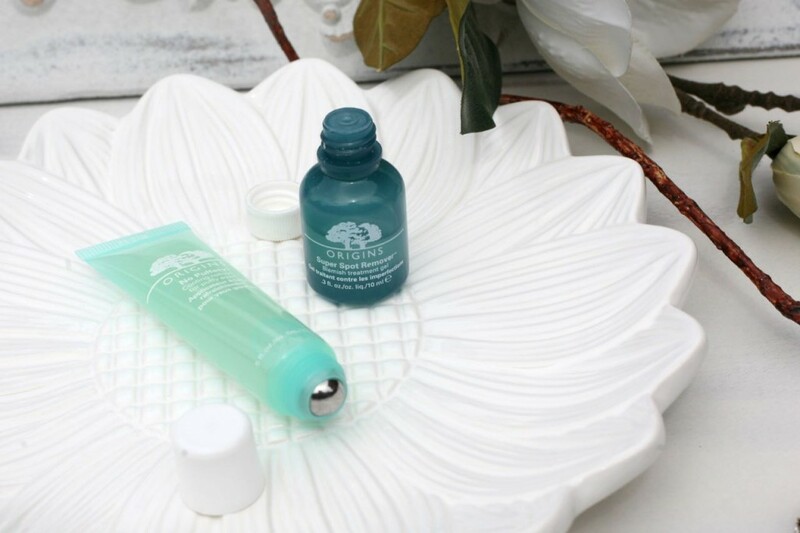 For my other skincare woe – tired puffy eyes, dark circles and the lot, the Origins No Puffery Cooling Roll-On (on the left) at £24 also comes in a gel form and contains Yeast Extract to de-puff the under-eye area and Hoelen Mushroom Extract which helps calm the skin. The bit I love though is the metal roller ball at the end which together with the gel itself is so refreshing to use and gives the added benefit of gently massaging the under-eye area to help improve circulation. I use this in the mornings and find it sits well under my makeup but for night I like to use something stronger like the Estee Lauder Advanced Night Repair Eye Serum and the combination of the two is working well for me. I’m not talking ground breaking stuff and if I actually got enough sleep like I’m supposed to then the results would be even better, but I do feel like my under-eye area is not as dry and is looking brighter than normal. These are both products I think are good to have to hand and I’m also looking forward to checking out some more skincare products from Origins. If you have similar concerns and are not quite happy with what you are using at the moment then definitely check these out. Or, if you think there’s something better out there then please let me know below – it’s always good to have a few tricks up your sleeve!